Frances Pollitt, a Bahá’í from Fryeburg, Maine, USA, enrolled in the Wilmette Institute’s Badí‘ (Bahá’í) Calendar: Reshaping Our Material, Society and Spiritual Reality course after reading recent guidance from the Universal House of Justice on understanding certain elements of the calendar. She discovered that there was much more to the Badí‘ calendar than met the eye and was strangely moved by what she learned. About the same time Frances also attended a Book 9 tutor training where emphasis was placed on allowing the arts to inform learning. As chance would have it, she and her husband were building a home in Wayland, Massachusetts, where the house designers asked them to explore a stained-glass window design to adorn a skylight. The designers themselves even began looking for Bahá’í-inspired themes. 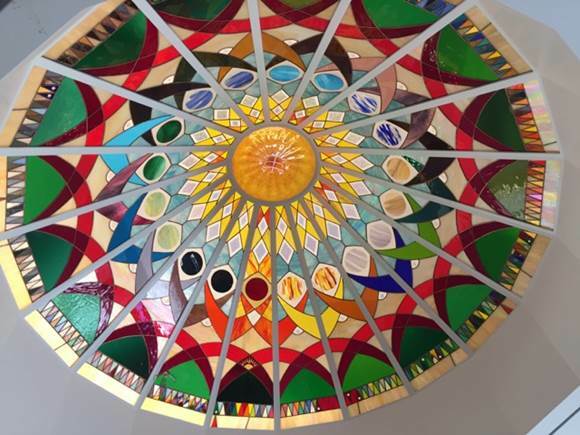 “The elements of the stained-glass skylight include 19 panels with 19 days marked in each panel. The year 173 B.E. (2016–17) was chosen to mark the solstices, equinoxes, and Holy Days. A hand-blown glass disk etched with the Bahá’í ringstone symbol crowns the apex of the 19 panels, which lie at a 45 degree angle. We tried to include as much symbolism as we could think of; for example, we chose a 45 degree angle for the panels: 4 + 5 = 9. “The four elements of Fire, Air, Water, and Earth were included in the design based on the Báb’s description. The Holy Days were marked with five-pointed stars, inspired by the words of the Universal House of Justice: “sacred moments are distinguished.” One of our greatest challenges in the design process was reshaping our understanding of time and space. “Carpenters, painters and designers on the house-building site lent their hands to the project, and I printed the words of the Universal House of Justice (quoted above) on a chart for all to read. As each panel was completed, it was installed for the benefit of the laborers on site—they all understood the elements of the Badí‘ calendar, not to mention the direction towards Bahji. 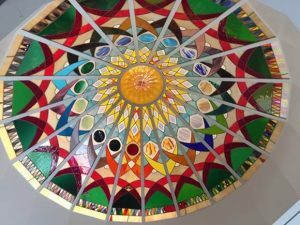 Click here for a three-minute slide show of how the stained-glass skylight was made. The chant is from the Persian Bayan. The hum in the background of the chant is created by a Shruti Box, an instrument that traditionally works on a system of bellows, creating a sound similar to the drone of a harmonium or bagpipes. A website about the skylight is available here.